Avenged Sevenfold guitarist Zacky Vengeance has paid tribute to Mike Portnoy's playing on the band's new album - Nightmare. 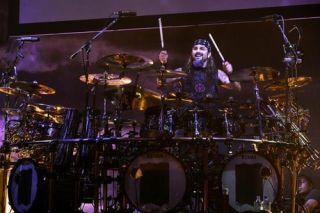 The axe-man told Rolling Stone that the Dream Theater sticksman stayed true to the drum parts written for the record by Jimmy 'The Rev' Sullivan, who died in December of last year. Zacky said: "Mike absolutely delivered on this record. We sat there and made sure everything was true to the demos Jimmy played and it came out amazing. I listen to it, and I never for a second don't feel like it's not Jimmy on the drums. No one can replace Jimmy, but Mike did what Jimmy would have done on this record, I believe." The guitarist also said that when it comes to finding a full-time replacement for The Rev the band are taking "baby steps", adding: "There may be a day where we come across someone we click with, or we could go onstage and it could be too hard to deal with. You just don't know until you're there."